Theodor Seuss Geisel, a.k.a. Dr. Seuss. 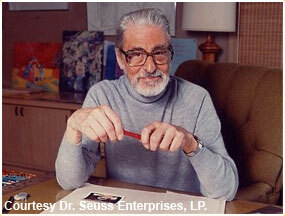 The Dr. Seuss "lost" manuscript, “What Pet Should I Get?” will be released as a picture book on Tue., July 28. The tale captures a classic childhood moment — choosing a pet — and uses it to illuminate a life lesson: that it is hard to make up your mind, but sometimes you just have to do it! It will sell for $17.99.